Take a look at the nearest tree. That tree is part of a community forest--a term used to describe all the trees and shrubs in your town. In Minnesota, trees cover about 27% of the land in our cities and towns. However, that percentage is declining due to stress from tree pests (such as emerald ash borer), drought, heat, and storms. Save energy--and money. Energy savings come from shading buildings, lowering ambient air temperatures, and reducing wind speed. Trees and other vegetation can lower air temperatures 5 °F compared with outside the tree-covered area. One well-placed large tree provides average savings of $31 in home heating costs each year. If you are ready to help your community forest, read on for details about selecting a tree, planting your tree, and caring for trees. Trees come in many shapes and sizes, and each is suited for different conditions. Think about where you will plant the tree and what your preference is for its full-grown size and shape. Check out the DNR’s tree planting page and the Extension’s list of species for each region to start. Talk to your city arborist or local plant nursery staff for recommendations. Spring and fall are best for tree planting, but you can also plant during summertime if you keep the tree well-watered. 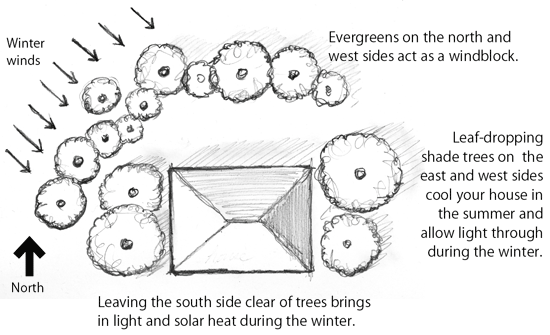 Read these directions for digging the hole, planting the tree, mulching, and watering. Remember to identify buried cables and pipes by calling Gopher State One-Call at 800-252-1166 before making your final decision or picking up a shovel. Mostly, just pay attention to your trees! Use this online tool to identify the trees around you. Watch mature trees for signs of tree pests or stress. Newly planted trees need watering for 3-5 years. In drought conditions, provide mature trees with water too. If you are familiar with your trees and want more detailed tree care advice, visit the DNR's tree care page. Shawna MullenEardley, a Minnesota GreenCorps member in Duluth, is gaining professional experience in urban and community forestry. She is part of a team in Duluth that is actively working to increase tree cover in the city. We asked her to share some of the projects she is involved in. How is the City of Duluth increasing tree cover in the city? The City of Duluth has a community tree planting program called Re-Leaf Duluth, which has a couple different components. One is a street tree planting cost-share program for residents. Citizens can pay $25 for a tree, and the city not only subsidizes the cost of the tree, but we plant it for them, provide tree stakes and mulch, and educate the homeowner on how to take care of their newly planted tree. Another component is community forestry, where citizens can partake in tree planting events. We call them Planting Parties, because they really are a lot of fun. The city received a grant this fall to plant trees around city buildings (to reduce energy use) and along bike routes (to encourage non-motorized commuting). All in all, we hope to plant over 1,500 trees this year. What is one of the projects you’ve been involved in as a GreenCorps member? I’ve worked to inventory every tree on the boulevards of Duluth. I have also recruited and trained volunteers to help collect inventory data. The inventory will be used to assess the multiple benefits that Duluth’s urban forest provides, and attach a dollar amount to those benefits. Important planning decisions, tree planting details, and priorities will all be developed based on the results of the inventory. What are the challenges and opportunities that Duluth faces? One of the biggest challenges will be to plant for the future. The climate is changing…and fast. Boulevards are already a tough environment for trees to be growing in, but add the heat and dry spells that are predicted for the future, and it makes it even more challenging. 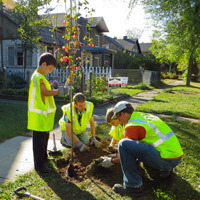 At the same time, Duluth is a community that understands the value of a healthy urban tree canopy and we have a large base of citizens who love to volunteer in our tree programs. We have the potential for great growth and innovation in the area of urban forestry. Minnesota GreenCorps is an AmeriCorps program run through the Minnesota Pollution Control Agency. Members gain valuable skills and job experience in the environmental field while giving back to the communities in which they serve. Applications are currently being invited for host sites and members for 2013-2014. Read more on our website. Celebrate Arbor Day this year! April 26 kicks off an entire month of celebrations and incentives for replacing trees lost during the past years' tornadoes, floods, blowdowns, and snowstorms. Visit the DNR’s 2013 Arbor Month page to locate a celebration near you. Check out the Minnesota’s Arbor Month Celebration, which includes seedling and tree planting, archery, a ceremony, and local Duluth leaders, May 15, 11:30 a.m.-2:30 p.m., Chester Park, (Duluth). Mother Earth Fest is environmental and cultural celebration in St. Paul’s West Side neighborhood. You’ll find dancing, music, food, youth projects, and exhibitors, April 20, 9 a.m.-5 p.m., Paul and Sheila Wellstone Center for Community Building (West St. Paul). Brooklyn Center EarthFest features Allison Warden, an Inupiaq artist and rapper from Alaska, exhibits about compost, home, garden, and energy, and kids activities, April 20, noon-4 p.m., Brooklyn Center High School. Do it Green! Minnesota’s Earth Day Celebration includes food samples, info tables, kids’ activities, music, and resources in Spanish, Hmong, and Somali, April 21, 12-4 p.m., Midtown Global Market (Minneapolis). The St. Cloud Area Sustainability Expo is a marketplace for green products, organic food and produce, and a place to learn about healthy, sustainable living. Includes family activities and the presentation of the 2013 Sustainability Awards by St. Cloud Mayor Kleis and featured speaker Don Shelby, April 21, 11 a.m.-3 p.m., St. Cloud River's Edge Convention Center. ArtStart’s EcoArts Fest educates and inspires the next generation of stewards for our earth through the arts, May 18, 11 a.m.-5 p.m., Harriet Island Grounds and Pavilion (Saint Paul). MN Goes Green is a free event at the newly renovated St. Paul Union Depot. Interactive entertainment and and educational activities will show you how to incorporate simple, practical, sustainable, and fun ideas into your everyday life, May 18, 9 a.m.-6 p.m.